Looking at the Cleveland Cavaliers roster, there are number of areas in which they could improve this offseason. Defense comes to mind first. The Cavs have been an underwhelming defensive club all season, with only two players — David Nwaba and Larry Nance Jr. — managing to stick out on that end. Furthermore, due to an injury-plagued season with plenty of trades, Cleveland has played a myriad of different lineups this season and have a hard time building chemistry and consistency as a unit. The Cavs’ need for a primary facilitator to speed up the offense and control the flow of the game is also apparent. Rookie point guard Collin Sexton has grown as a floor general, improving his decision-making and court vision over the course of the season. Second-year forward Cedi Osman is solid in spurts as a floor general, possessing solid court vision and passing ability himself. Big men Kevin Love and Nance are great facilitators for the Cavs out of the pinch post and backup point guard Matthew Dellavedova is a patient playmaker who has been a calming presence off the bench. Yet, Cleveland’s averaging just 20.8 assists per game, 29th in the NBA, meaning that there’s too much one-on-one play and not enough easy shots being generated. Of course, the Cavs’ haven’t had the most talented squad this season, so their lack of efficiency (44.8 percent, ranked 28th in the NBA) plays a hand. However, Cleveland would almost certainly be better off with a player who can control the pace of the game and generate easy shots for his teammates from the outset. That said, the Cavs are in position to solve their issues with their two first-round picks in the 2019 NBA Draft. One pick is sure to be a top-five pick and likely a top-three selection, while the other (traded to them by the Houston Rockets) will fall within the last 10 picks of the first-round. With the first pick, there’s much debate about who Cleveland should select. Some say Zion Williamson, others say Ja Morant. Others still say R.J. Barrett. The two Duke University products (Williamson and Barrett) have long been seen as consensus top-three selections while Murray State University’s Morant has been a fast riser on draft boards with his passing prowess catching the eyes of the nation. For my money, the choice for Cleveland should be Morant. Selecting Morant would allow Sexton to be a scoring-minded combo guard, his most natural role, which wouldn’t be the case with Barrett. In the case of Williamson, though he possesses the most all-around talent in the draft and is the player with the most potential, he’s the worst fit of the three when looking at the current configuration of a Cavs frontcourt that looks at Love, Nance (and seemingly even Tristan Thompson) as cornerstone big men and pay them like it too. Cleveland would have to avoid switching as much as possible with a backcourt of Sexton and Morant, with Sexton weighing just 190 pounds and Morant even lighter at 175 pounds. However, the duo would make for a speedy backcourt that compliments each other well on offense. Both players would have to work on their finishing ability around the rim but just as Sexton improved his interior game throughout the course of the season, so too could Morant. With the New York Knicks holding the league’s worst record, the Cavs may never have to decide whether or not to pass on Williamson although if they did, they would need to strongly consider trading down a spot or two in the draft to pick up a future first-round pick, like the Boston Celtics did when they traded the first overall pick in the 2017 NBA Draft to the Philadelphia 76ers for the third overall pick in the same draft. However, with their Houston pick, regardless of whether they select Morant, Barrett or Williamson, they’ll need to consider adding the type of shooter they’ve missed since they traded Kyle Korver to the Utah Jazz. A player who can also provide valuable defense on the wing, increasing their defensive aptitude on the perimeter without sacrificing their spacing or offensive firepower. That player is the University of Tennessee’s Admiral Schofield. A shooting guard with an NBA-ready body, pure shooting ability and the ability to guard up to four positions (and well). Looking at Cleveland’s perimeter, should they select Morant, they’ll start him, Sexton and Osman at the 1,2 and 3 next season. That would lead to Matthew Dellavedova, Brandon Knight and Jordan Clarkson playing as the 1, 2 and 3 in the second unit, unless the Cavs opted to start Knight at the beginning of the season instead of Morant, akin to how they started George Hill over Sexton at the beginning of the season. Though that would seemingly leave no room for Schofield but at 6-foot-6 and 241 pounds and a physical defender down low, the Illinois native could come off of Cleveland’s bench as a small-ball four if needed. Besides, the Cavs of course don’t have to make platoon swaps and can choose to mix-and-match, utilizing Osman (who’s 6-foot-8, 215 pounds) as a small-ball four, keeping Love as the four-man or even bring Nance in to play power forward. The luxury of having a player with his physical profile and three-and-D skillset would be highly beneficial for the Cavs’ ability to match up with other teams defensively. A traditional senior, Schofield has averaged a career-high 16.3 points per game this season (15.1 points per game over the last two seasons) and has made 38.4 percent of his three-point attempts in his four seasons at Tennessee. He’s also averaged 6.2 rebounds per game over his last two seasons with the Volunteers. 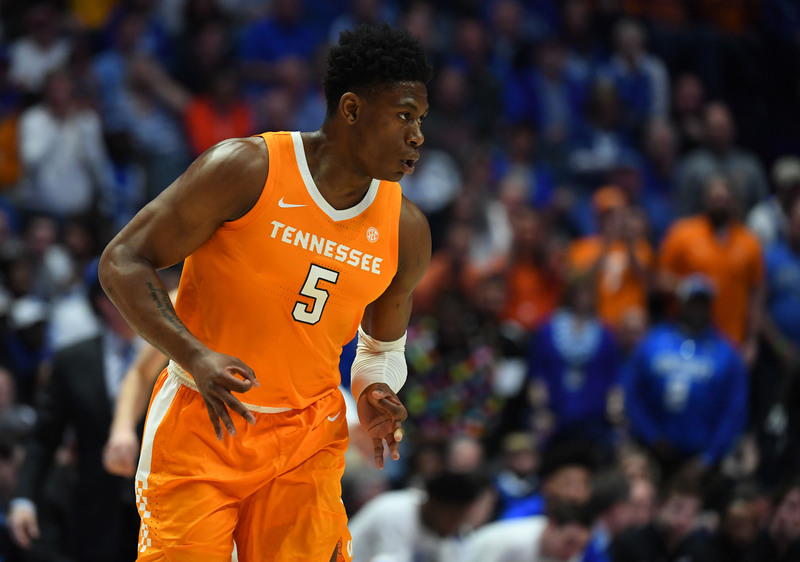 He’s not a great ball-handler and it limits his ability to create for himself and others but in a J.J. Redick-like role on offense, Schofield should flourish. The, when Knight and Clarkson’s contract expire in 2020, then Cleveland can move Schofield to the wing full-time. For Cleveland, the 2019 NBA Draft should be about putting together the best team possible. Had they never re-signed Love or had Love not shown that he was an abysmal defender when playing center, then selecting Williamson first overall would have been a homerun selection. However, with it obvious that the starting unit is lacking a floor general that can create easy offense for the team as a whole and with Cleveland’s defense far from reputable, selecting Morant and Schofield gives them the chance to shore up their two biggest problem areas.